I don’t review or even use a lot of facial scrubs, but I’ve made an exception for ElishaCoy Milk Cacao Black Sugar Scrub. See, my skin is a little bit like my dog, Callie. I adopted Callie years ago from a rescue – she was already an adult when she came to live with me, and I didn’t know a lot about her. One day I came home from work to find she’d pooped in the middle of the living room. I’d already had a pretty bad day, and coming home to a house that smelled like the animal shelter was just too much. As soon as I saw it I yelled a series of expletives and seethed in anger. It was clear that I was furious, and Callie, being the sensitive creature that she is, responded to this anger by cowering in fear, and then peeing. I couldn’t yell at her for it – she couldn’t help it for one thing, and for another thing, I realized in that moment that yelling at her would probably just make her pee more. Since that moment, I’ve had to get creative when it comes to disciplining her, finding the careful balance in my voice between stern and angry. Just titch too far into an angry pitch, and I would have to contend with dog urine. I’ve had to handle my skin with the same finesse – if I go in too forcefully when I break out or get dull, my skin responds by producing a horrid array of cystic pimples and patches of dry, irritated skin. For this reason, instead of facial scrubs, I usually opt to exfoliate with small amounts of chemical exfoliators such as BHA or AHA, or a washcloth when I need physical exfoliation. 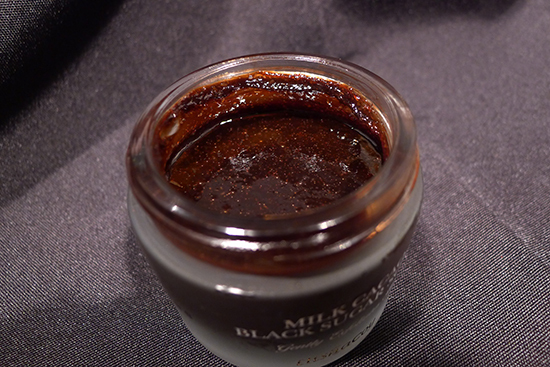 However, the allure of ElishaCoy Milk Cacao Black Sugar Scrub ($13) was just too great. How could I pass up putting chocolate on my face? Plus, sugar is one of the safer scrubbing agents since the crystals are less jagged than salt, and unlike the sharp, unyielding shards of walnut shell found in scrubs like St.Ives Apricot Scrub, sugar melts into wet skin. 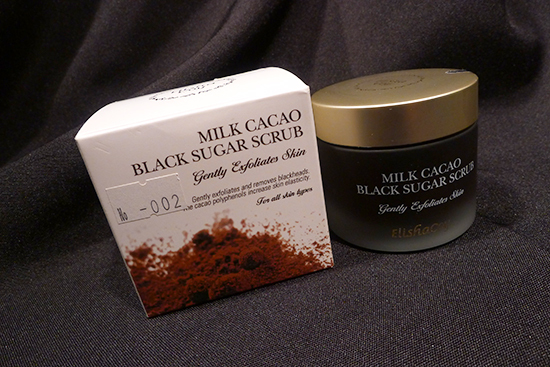 ElishaCoy Milk Cacao Black Sugar Scrub is an exfoliating facial scrub from South Korean beauty brand, ElishaCoy. It promises to exfoliate, help remove blackheads, and provide nourishment for the skin. Theobroma Cacao (cocoa) Fruit Powder – In addition to being rich in antioxidants, cocoa also contains a constituent called theobromin, which acts as a vasodilator, increasing the blood flow to the skin. Increased blood flow helps prevent dryness and promotes healing. Fun fact: According to this study, eating chocolate rich in flavanols helps protect skin from UV rays. This makes me feel much better about the dark chocolate bar I’m shoving into my face as I type this! Macadamia Nut Oil – This oil is rich in antioxidants, Vitamin E, and palmitoleic acid, which helps retain elasticity. Milk – In addition to lactic acid, which gently exfoliates and softens skin, milk also contains variety of skin-healthy nutrients such as zinc, and Vitamins A, D, and B12. Oryza Sativa Extract – Rich in antioxidants and essential fatty acids, Oryza Sativa (AKA rice) Extract also has anti-inflammatory properties and contains a significant amount of Vitamin E. It’s also rich in silica. Silica (not to be confused with silicone, which is an entirely different substance) is naturally produced by the human body and helps keep our skin, hair, and nails healthy. As we age, we produce less of it, but using it as a topical treatment helps keep skin moist, healthy, and bright. I was not so excited to see my old foe Cetearyl Alcohol in there. I’ve been sporadically trying products that contain the ingredient (which is very hard to avoid! ), and it seems that some affect me more than others. My suspicion is that it has to do with how much the formula contains. In a wash-off product like this one, it doesn’t seem to cause any problems for me. Aside from Cetearyl Alcohol, this ingredient list didn’t raise any major red flags in COSDNA. I use ElishaCoy Milk Cacao Black Sugar Scrub once a week, max. I use a daily BHA, and the occasional washcloth, so I don’t need to physically exfoliate very often. It’s probably best to use it at night, but Saturday morning is my favorite time of week to do extra facial treatments like this one. To use, I take a nickel-sized blob and very gently massage it over my clean, wet face. I find it works better when my fingers are wet as well. The instructions say to massage until the sugar has completely dissolved. However, it actually take a while for all the sugar dissolve, and the one time I did this, it was definitely too much. Instead, I massage gently until about half the sugar is dissolved, avoiding the eye area. The process of massaging it in is extremely luxurious. 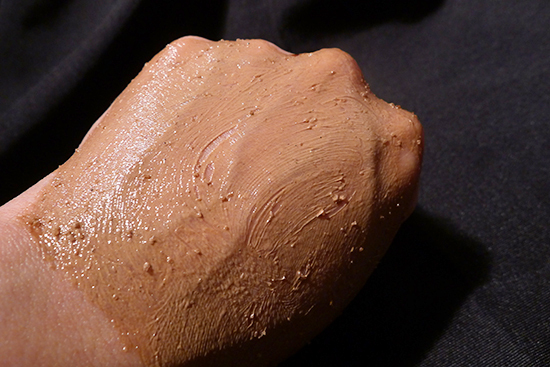 The mixture starts off as a deep reddish brown, but as it’s emulsified on the face it looks more like milk chocolate. Something about the color change is highly satisfying. Once I’m done, it rinses away easily with warm water. 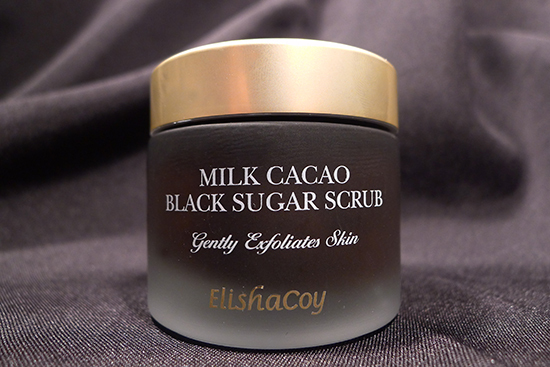 ElishaCoy Milk Cacao Black Sugar Scrub comes in a frosted glass tub. I personally don’t mind tub packaging, but I know a lot of people don’t like tub packaging because it’s less hygienic than a tube or a pump. This product does come with a spatula, but I prefer to use clean fingers instead. I will say, this can get a bit messy when applying. The consistency is thick but can be drippy. I inevitably have clean a few little chocolate blobs off my counter when I’m done using this. 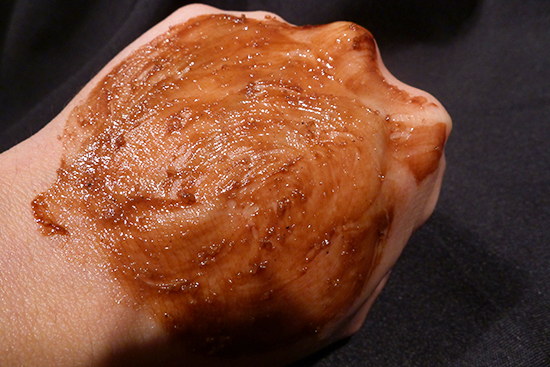 ElishaCoy Milk Cacao Black Sugar Scrub smells amazing – like straight up cocoa butter. It smells fantastic in the jar, but the chocolate scent gets even more divine as I massage it into my face. The scent disappears as soon as it’s rinsed away, which, I must admit, bums me out a little. 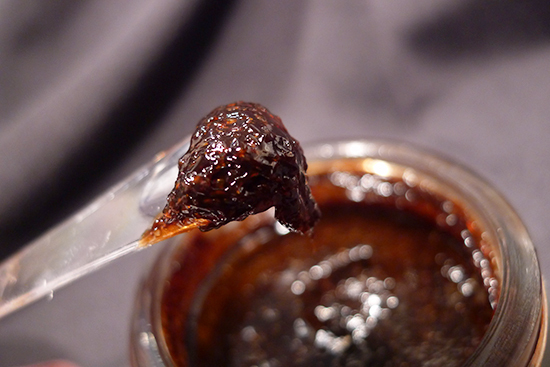 I’ve been using ElishaCoy Milk Cacao Black Sugar Scrub sporadically for a couple of months, and I really like it! It does a good job sloughing away dead skin cells, and as long as I don’t scrub too long or hard, I don’t experience any irritation as a result. My face is soft and visibly smoother for days after I use it. It has not broken me out at all. I’m fortunate not to have any blackheads, so I can’t speak from experience about this product’s efficacy at removing them, but I can say that in theory, it should help with their appearance. My dry, sensitive skin isn’t usually a fan of scrubs, but this one is gentle enough that it doesn’t cause any problems, and I love the results I get from using it. The chocolate scent and the creamy texture make it an absolute pleasure to use. The fact that it’s so affordable makes it just about perfect! I think this product would work beautifully for dry or oily skin, as it’s neither greasy nor drying. Value: 5/5 – $13 is a steal for such a lovely scrub! I bought mine from Bring Bring Shop on eBay, where it sells for $13 + free shipping. It ships from South Korea, but the shipping is pretty speedy. It arrived on my doorstep in North Carolina 12 days after I ordered it. I never expected to see those two subjects in one post. 😛 Hahaha. Love the lead in. I would absolutely want to eat that every time I used it. Lol. You should definitely get it! I think you’d love it! I’m trying to get my hands on some snail cream and the Benton products you’ve reviewed though, so my face can recover itself again. Ugh, so sorry Dana! 🙁 Those stubborn breakouts are the absolute worst! I hope the Benton helps you out as much as it helped me. I’d love an update when you finally get rid your breakout! Oh this looks really interesting, especially how the colour and texture changed. 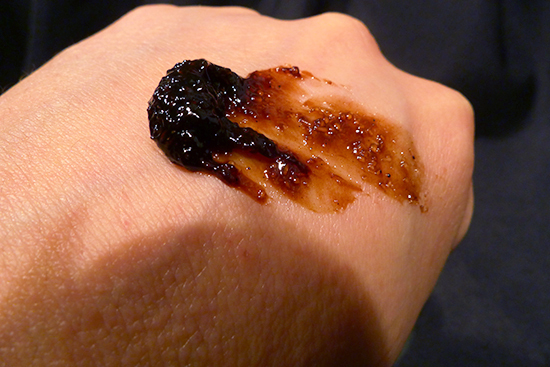 I’ve only tried the Skinfood Black Sugar Scrub and love it. 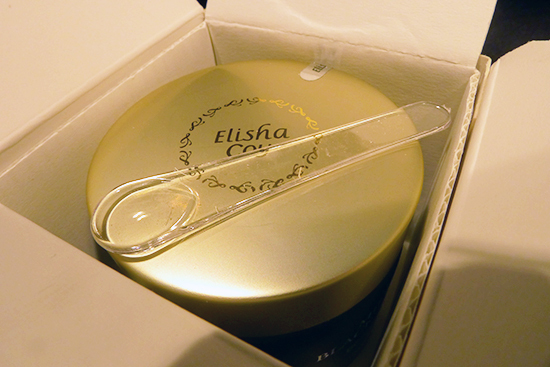 OMG, the packaging looked just like the one from Missha! I’ve tried their cacao scrub which came with the exact same packaging with this one, and it’s reaaallly good! A little goes a long way. Kerry, you should try Klair’s Gentle Black Sugar Facial Polish! It makes my skin so soft and exfoliates well. Most exfoliaters dried out my skin. (oily, acne, sensitive) I’ve also been using the benton toner and essence which has been helping my acne. I’ve been using Ciracle Anti Blemish wash with my acne as well and these products have been a wonderful combination in helping my skin stay clear. Or maybe it’s because fall now and my face isn’t that oily and sweaty from the heat. I buy all of my skincare products at wishtrend.com now! They offer such a wide spectrum of natural, organic, healthy products that don’t irritate my skin. On a side note, do you think the benton steam cream would be too heavy on my oily acne sensitive skin? Hey Lily! I will definitely check out that scrub. It sounds fabulous! I have bought a few things from the Wishtrend eBay shop, but haven’t yet shopped their .com website. Maybe I’ll take the plunge with the sugar scrub. I don’t think the Benton steam cream would be too heavy for your skin type. It does feel heavy for the first few minutes, but it absorbs quickly and feels weightless afterward. I think it would perform especially well for you in the fall/winter! If you do wind up trying it, I would love to know how it works out for you! 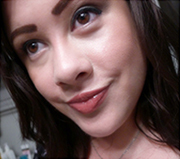 I’ve been shopping on Jolse.com for all my Korean skincare products. They offer free shipping with every purchase no matter how little you spend, their products are listed at a cheaper price than wishtrend.com, and they have just as much of a variety of products (if not more) than wishtrend.com. – Exfoliate 1-2 times per week and it’ll help get rid of any dead skin cells that build up and cause acne. – Avoid facial washes with Sodium Laurel Sulfate or Sodium Laureth Sulfate – they’re only there to make it foamy and are very harsh on the skin, tending to overdry skin (which makes the skin produce even more oil afterward). – Wash face with lukewarm water, then finish off with a cold water splash to close the pores. Hot water will overdry your skin and make it produce more oil later on. Hey Christine! Yes, I discovered Jolse recently but haven’t ordered from them yet. It’s good to know they come recommended!